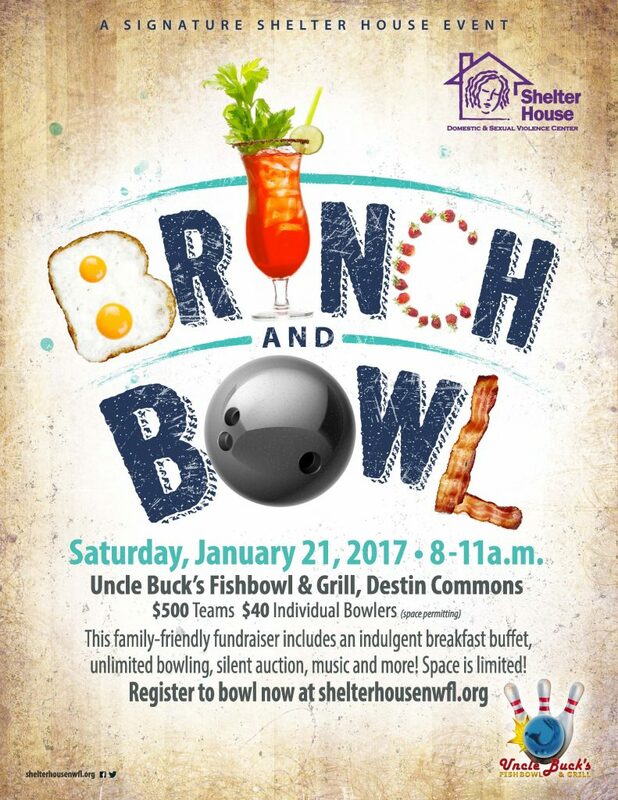 (DESTIN, Fla.) January 3, 2017 – Shelter House presents Brunch and Bowl on January 21 from 8 a.m. to 11 a.m. at Uncle Buck’s Fish Bowl and Grill at Destin Commons. This family-friendly fundraiser includes an indulgent breakfast buffet, unlimited bowling, silent auction, music and more. Corporate teams are encouraged. Registration is $500 for teams and covers six bowlers, food and lane sponsorship for your business. A very limited number of spots are available for individual bowlers at $40 per person. Registration for Brunch and Bowl is available at www.shelterhousenwfl.org. More information can be found on the Shelter House Facebook page at www.facebook.com/ShelterHouseNWFL.